I called the “Plumbing Doctor” this morning and recieved a quick call back. I was fortunate to get a quick appointment with this outstanding company. Mark, the Field Manager, who did the work, called before he drove out to my rental house and asked me what the problem was. I told him it was a leaky bath tub faucet. He asked me if I could locate a brand name on the faucet. After looking at the unit, I told him the name. He did this to save time (and purchase it in advance) in the event he did not have it on his van. As it turned out, he had parts for this specific brand in his very modern and large van. There are colorful “Plumbing Doctor” logos on all sides of this vehicle. I have used several plumbers in the area, but Mark is by far the best and most professional plumber I have ever worked with. First, he has a price list so you can clearly see what you will be charged for all plumbing services (and I found it very reasonable indeed). I am tired of vendors doing work and then charge high prices that they seem to make out of thin air with no rationale what so ever. A price list keeps vendors honest (are you reading this vendors!!!). Mark recently received a one star rating from a business who complained about billing (this business did not use Mark’s service to find out the extreme quality), are you kidding me?? Please pay no attention to that rating. I can tell you from experience, that Mark and his business are legitimate and honest as they come!! That business totally missed out on on a high quality plumber. Second, his work totally exceeded the price I paid. Plumbing Doctor was the 2nd business I called to fix this problem (the 1st business could not fix it), but Mark fixed it perfectly with no problems. I watched Mark work and he explained what he was doing and why he was doing it. He has all the tools and the experience to tackle the toughest jobs. He leaves the work area clean and uses special caulking to leave a nice, clean finish. Lastly, I highly recommend the “Plumbing Doctor” for any landlord, homeowner or business who wants quality work at a reasonable price. They did a great job for us on our water heater! A part went out, he knew immediately over the phone what the issue was. Scheduled an appointment the next day. It was a very fast fix and we’re so thankful to have hot water!! The best professional company for repairs I have experienced in Reno ! Mark has been the plumber sent to my home twice now and I am amazed and thankful for his professionalism, honesty and knowledge. He’s not afraid to share what he knows and educate you on little things you can do on your own. My recent experience tops it all because Plumbing Doctor had him respond within an hour of me calling. I had a job that I should never have let anyone else touch besides the Plumbing Doctor. Lesson learned and they are my Go To Guys !! 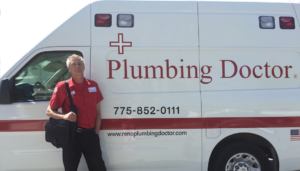 We had a great experience with Mark from Reno Plumbing Doctor. We had a pipe leaking underground on the side of the house. He rearranged some other appointments to get out to us the next morning. He fixed the problem and actually charged under the original price quoted! Mark was professional and explained exactly what the problem was and what he proposed to fix it. We were happy with the quick, courteous service and recommend this plumbing service.